The following is a list of resources for active-duty soldiers and veterans. It is by no means exhaustive and we do not guarantee the services of any of the organizations linked to. Like everything else in the OIL, much of this is Oklahoma-centric. 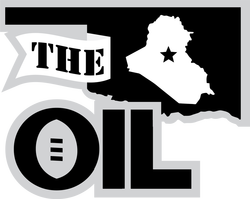 If you were referred here from elsewhere, the OIL is a fantasy football league started in Iraq in 2006 by Oklahoma Army National Guardsmen. It's grown into a highly-competitive annual fantasy football league. But it's also a veteran community committed to keeping in touch with the brothers-in-arms we served with in Iraq. The community now has 42 teams and has been used to chronicle the oral history of the members' year in Iraq. We hope this page helps you in some way. Feel free to contact us below if you have suggestions or further questions. We will do our best to help you find the help you need. Addiction Center: AddictionCenter.com is a professional web guide that connects individuals struggling with addiction to treatment options. Alcohol Addiction Center for Veterans: Alcohol addiction resources specifically for veterans. American Addiction Centers: This veterans-specific page summarizes available governmental and organizational resources, making them easily accessible to veterans searching for help with addiction issues. It includes 48 citations of the latest studies and 10 external resources for veterans seeking help. DrugRehab.com Veterans & Addiction: DrugRehab.com is a web resource provided and funded by Advanced Recovery Systems (ARS). ARS is an integrated behavioral health care management organization dedicated to the treatment of addiction, substance abuse, eating disorders and mental health issues. List of Addiction Resource Groups: Use Pinnacle Peak's list of recovery groups and organizations for any category of addiction. The Mesothelioma Veterans Center: Free help for veterans exposed to asbestos. Accreditation Search: This VA page allows you to search for VA-accredited attorneys, claims agents, and service officers. American Legion: The American Legion offers a number of programs and services for veterans to reap the benefits they earned. Disability Claims FAQ: Oklahoma City law firm Colbert Cooper & Hill answer frequently-asked questions about VA disability benefits. Disability Claims Process: Oklahoma City law firm Colbert Cooper & Hill outlines the process of VA disability claims. Disability-Friendly Homes: This article helps explain how to make a home accessible for disabled vets. Iraq and Afghanistan Veterans of America: IAVA's rapid response referral program provides individualized case managers for veterans by completing the form at their site. Oklahoma Department of Veterans Affairs: The OKVA keeps a helpful list of links for access to your benefits (even if they are printed in Comic Sans). Oklahoma Veterans Centers: Directory of VA medical centers, outpatient clinics, veterans centers, intake locations, and more. Social Security Administration: If the VA deems soldiers or veterans disabled, they may qualify for Social Security Disability Benefits. The Social Security Administration’s website provides benefits applications, office locations, and eligibility requirements. Veterans Corner: This Goldsby organization has helped thousands of veterans with every element of veterans benefits. Their website is a fantastic resource for finding the help you need. You can also contact them directly and a representative will give you one-on-one assistance. Veterans of Foreign Wars: The VFW's National Veterans Service Center provides all kinds of help for veterans seeking benefits. National Archives Center: Request a copy of your military documents. National Veterans Center: Resources to locate and retrieve important documents, such as your DD-214. Oklahoma Military Department: Contact OMD to track down military and medical records. Department of Labor VETS program: Federal program finding employment for veterans. Great Sample Resumé.com: If you're applying for a job, you need a resumé. This site will help you with that. Oklahoma Employment Security Comm. Veterans Program: OESC works to find employment for veterans. Open Colleges: This page gives advice on writing a resumé. Reddit's Hire a Vet subreddit: A place to connect veterans with employers who want to hire them. Resume.io: This site provides in-depth examples of how a resume should look for dozens of job fields. Resumé Templates: This site provides over 400 resumé templates. USAJobs.com: Directory of federal jobs that give veteran preference. VA Employment Services: Veterans Affairs program to ensure veterans have jobs. We Hire Heroes: National job board for military veterans (link is for Oklahoma City jobs). Amy K. Hart, JD: Attorney Amy K. Hart has been representing veterans in VA compensation cases since 2004. She is based in Bartlesville, Oklahoma. Oklahoma County Veterans Diversion Program: This Oklahoma County program gives veterans in legal trouble a second chance. Be sure to ask about it if you find yourself in trouble. Oklahoma's Lawyers for America's Heroes: This is a service of the Oklahoma Bar Association. Complete and submit the form and an attorney who specializes in that field will contact you to provide pro-bono legal services. VA Home Loan Program: Many veterans qualify for this home mortgage program. See link for details. VA Housing Assistance: Directory of resources for homeless or struggling veterans. OKC VA Housing Assistance: Oklahoma City-specific resources for homeless or struggling veterans. Low VA Rates.com: Mortgage lender specializing in VA loans. VA Mortgage Center.com: Mortgage lender specializing in VA loans. Veterans, Inc. Housing Program: Organization dedicated to finding housing for veterans. Veterans United.com: Mortgage lender specializing in VA loans. Cliburn used this company for his home loan and was very satisfied with the service of loan officer Andy Miller (who is a veteran himself). Military Bases.co: For those still in the military, use militarybases.co to learn all about your next duty station. Oklahoma Adult Crisis Centers: Adult Crisis Centers provide non-hospital emergency services for adults, eighteen (18) and older, with mental health, substance abuse, or co-occurring issues. Veterans Crisis Line.net: Provides 24/7 live chat for any veteran experiencing a mental health crisis. Vet2Vet Crisis Hotline: Provides 24/7 live chat with a fellow veteran. Disabled American Veterans: DAV offers free transportation to and from VA medical appointments. Lyft: Don't drive drunk. Call for a Lyft instead. Uber: Don't drive drunk. Call for an Uber instead. OKC taxi services: Don't drive drunk. Call a taxi instead. Oklahoma Women Veterans Organization: Provides all of the above services specifically to women veterans. Do you have a service or category we should add? Let us know!